As much as I enjoy The Sixth Gun, I'm starting to feel like this arc is dragging a little too much. Drake Sinclair, the main character of this comic, has been missing for a few months now, and without him, things are kind of grinding to a halt, as the supporting characters have a few conversations with important people from their pasts. 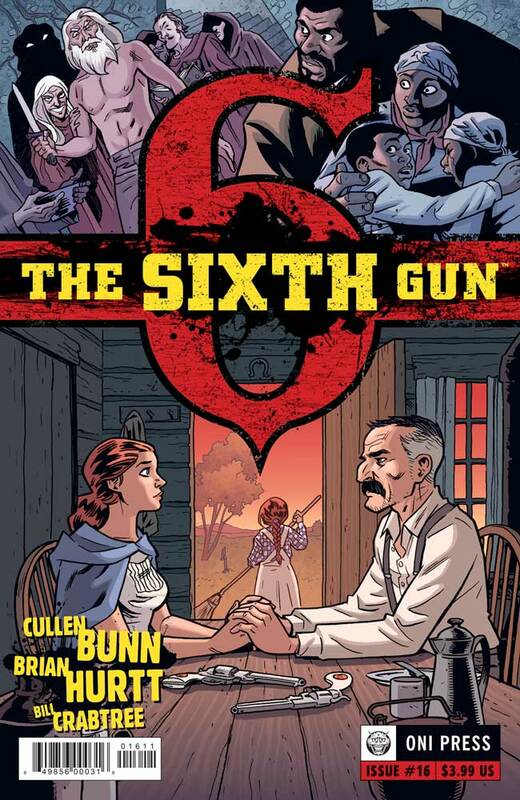 Becky Montcrief, who is the owner of the titular sixth gun has a strange chat with her stepfather. He's not a spirit, it's more like he's speaking to her through time, and gives her a few pointed warnings about how to handle the gun, and who she can trust (basically no one). Last issue, we saw Gord Cantrell return to the plantation where he grew up, and interact with a number of spirits who seem to inhabit the place, including the ghosts of his family. Now, we as an audience learn how his family died in the first place, as Gord learns that he could bring them back. All of the things that happened in this issue are important, and I imagine will be revisited time and again in the issues to come. Like many a series in the middle of an arc, it feels like it's grinding along and could use a bit of oil, but this is still one of the better comics on the stands.